Back the truck up! 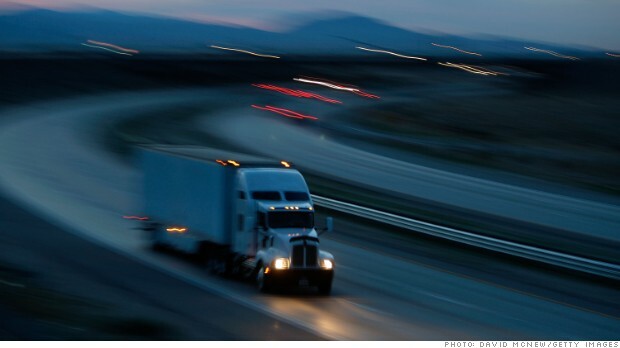 Shares of two major trucking companies were on fire Monday. YRC Worldwide (YRCW) surged 41%, and Arkansas Best (ABFS) jumped 39%. The gains pushed the Dow Jones Transportation Average (DJT) to an all-time high. It was a remarkable achievement considering that FedEx (FDX), one of the largest components of the transport index, was not the main driver, as one trader pointed out on StockTwits. The rally came after YRC reported a quarterly loss late Friday that was smaller than the loss it suffered in the same period a year ago. It was a rare bit of good news for YRC, which has been struggling to avoid bankruptcy since it went on a debt-fueled acquisition spree just before the bottom fell out of the economy in 2008. YRC was nearly delisted from the Nasdaq in 2011 after its stock fell to 3 cents a share. But the stock has come roaring back in May, climbing more than 70% in the past two trading days alone. The stock hit a high Monday above $14 a share. While the company still has a lot of work to do, YRC has made significant progress on its turnaround plan, according to analysts at BB&T Capital Markets, who raised their rating on the stock to Hold from Underweight. On StockTwits, traders welcomed the rebound, but there was some debate over how long the momentum will last. $YRCW back above 13 okay, I'm getting a feel for your scalping ranges. Meanwhile, shares of Arkansas Best rallied after the company said it had reached a tentative 5-year contract with the Teamsters Union. The news seemed to ease concerns about the company's labor costs, which have weighed on the stock recently. $ABFS reached tentative deal with Union. Been negotiating for a long time & it looks like they are getting close to official deal.